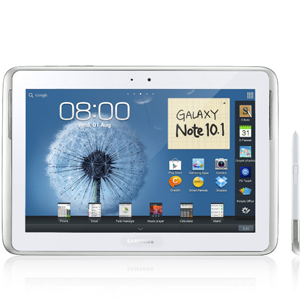 Although the original Samsung Galaxy Note held a unique product segment by being neither traditional tablet nor traditional phone, the Galaxy Note 10.1 is clearly a tablet. However, the device packs some features from its namesake by including S-Pen support. The device itself packs a healthy specs punch with a quad-core 1.4 GHz Samsung Exynos 4412 processor. The processor is backed by 2 GB of RAM, up to 64 GB of storage, a 7000 mAh battery, and a 10.1" 1280x800 PLS screen. All of this is packed into a lightweight 600 gram package that is just 8.9 mm thick.